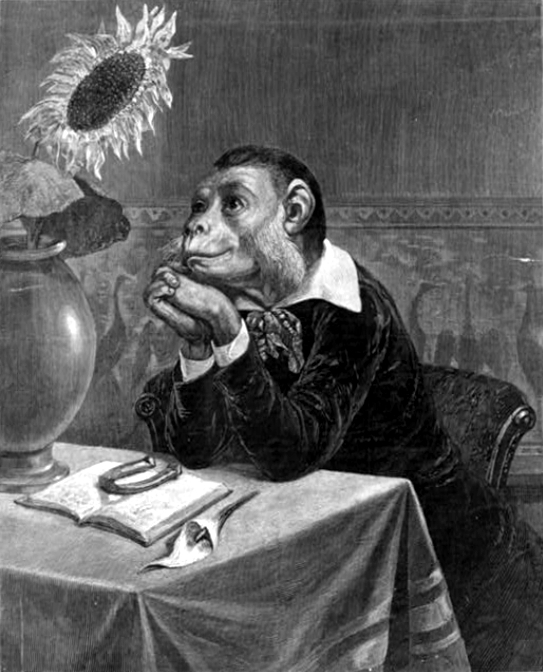 The Aesthetic Monkey / engraved, by permission, from the picture by W.H. Beard, in the possession of Mr. Hugh Auchinclos. A set of very diverting, if not very legitimate, performers made their first appearance last night on the stage of this theatre—to wit, the celebrated Parisian monkeys. Since quadrupeds of all sorts have, for some time, more than divided the plaudits of the town with biped players, it may perhaps be no intrusion for animals which sometimes walk on four legs and sometimes on two, to put in their claim for the support and approbation of the lovers of the drama; and since many "walking gentlemen" and "low" comedians ape the characteristics of the monkey tribe in a manner occasionally so perfectly natural that the copies can hardly be distinguished from the originals, and receive for their grimaces the encomiums of the spectators, neither they or their admirers can complain that the monkeys should return the obligation, and mimic their eccentricities for their own objects and ends. The performance of these miniature comedians commenced last night with the entrance of a little gentleman, who, after bowing to the audience, advanced with a very dignified step to the foot lights and reaching out his hand presented the leader of the orchestra with a scroll of music. There was something so very funny in the way in which this was done that all disapprobation was merged in laughter. The house was taken by surprise, and rang with peals of merriment and applause. This little gentleman, Il Signor Ambrogini, having retired, the celebrated Mimi went through the various evolutions of dancing, broad-sword fighting, playing the tambourine, &c. he produced his passport, made love to very little lady, &c. and conducted himself with great dignity and elegance. Signor Brazilini accompanied him in a variety of his movements, and played a solo on a very minute pair of castanets. Mademoiselle Chieni, a lady of rather larger dimensions, was then announced, and made her debut in the character of Madame Pompadour; she was attended by her valet, Monsieur Jacko, a pretty little specimen of the natives of an Indian forest. What was called a "Cabinet dinner" succeeded, at which the company sat as heavy and stupid as most persona do at Cabinet dinners of the present day, whilst the servant performed some comical antics behind the backs of his betters. No sooner was the drama over, than Mr. Yates himself came forward, and announced that a "Jim Crow," (neither of the celebrated Mr. Rices) was taken suddenly ill, and begged the company to excuse his appearance. The request was granted amidst loud cheering. The curtain then fell, and Mr. Yates again came forward, and assured the audience that his monkeys were the "celebrated" monkeys; that other managers had advertised monkeys, and that other monkeys might possibly appear in other places, but, knowing the passion of the town for novelty and for animal actors, he had resolved to be first in the field, and had accordingly presented them with a set of performer for whose efforts he solicited their kindness. The announcement was followed by an uproar of applause, and the successors of Garrick, Kemble, and Kean may be considered installed in their present situations.